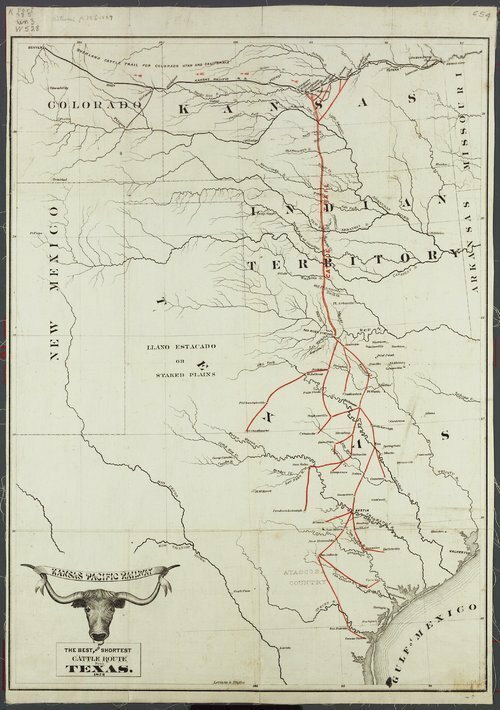 This map shows the Kansas Pacific Railway routes from Texas, through Indian territory (Oklahoma), to north central Kansas. In Texas there are 35 named stations or towns; the southern most is Corpus Christi and the northern most is Red River Station. At the northern terminus in Kansas are the towns of Morgans, Wilson, New Abilene, Ellsworth, Brookvillle, Salina, Solomon and Abilene.